Last year I participated in a Zombie Walk in Fairborn Ohio, near Dayton, with my good friends, Benjamin Rogers and Beth LaFond, who are both authors in their own right. We signed books, hung out with all the great folks who run the event, and had a blast. 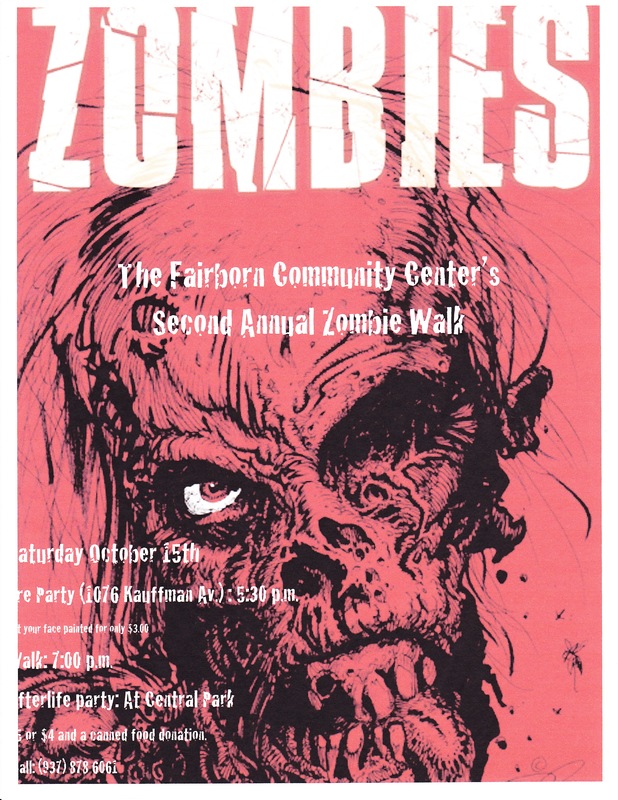 This year, the event takes place on October 15th, and much like last year, it is being done to support the Fairborn Community Center. There is a Pre Party where my friends and I will be selling and signing our books, which is located at 1076 Kauffman Avenue, and that starts at 5:30pm. They will be doing zombie face painting for $3 for the zombie walk. The walk itself is at 7pm and there will be an Afterlife party at Central Park. Cost to participate is $5 or $4 and a canned food donation, which is all going to a great cause. If you are interested in participating and want more details, give them a call at 937-878-6061. Again, this is for a great cause. I would love to say hello to anyone who can make it, and shamble along the streets of Fairborn with you! This entry was posted on September 21, 2011 by patrickdorazio. It was filed under Beyond The Dark, Comes The Dark, Into The Dark and was tagged with Book signing, convention, Zombie Walk, zombies. The sample was a great read. I’m impressed with your body of work. My zombie book, “Sword of the Dead,” will be a movie. Logline: A martial artist and his team of misfit fighters are hired by a beautiful mystery woman to destroy Ninja Zombies that have invaded her town. Perhaps you can check out my sample sometime. Sounds cool. I will check out your sample! Read the bit on your website…it sounds like a great start to the story. Sort of the setup for the Seven Samurai or something like that. Very cool! I’m glad you like it. Would you consider reading some more for possible endorsement to be published in the book and used in my marketing? My background is in Journalism and PR. I would, but the challenge is that I have quite a few books to read before I could get to it. I have committed to numerous people to read and review their work. So if you would need it quickly, I wouldn’t be able to help, but if I could look at it a month or more down the road I’d be happy to!